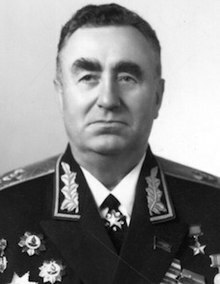 Pavel Fyodorovich Batitsky (27 June 1910 – 17 February 1984) was a Soviet military leader awarded the highest honorary title of Hero of the Soviet Union in 1965 and promoted to Marshal of the Soviet Union in 1968. Batitsky served in the Red Army from 1924 and was commander-in-chief of the Air Defense Forces from 1966 to 1978. Following the death of Joseph Stalin in 1953, he was chosen to execute Lavrentiy Beria, the former head of the NKVD. He was born in the Ukrainian city of Kharkiv and served in the Red Army from October 1924. At the age of 14, he entered the Kharkov Military Preparatory School (soon relocated to Poltava) and in 1926, was sent to study at the Military Cavalry School, graduating in 1929. From March 1929 to May 1935, he served in the cavalry and commanded a platoon and squad in the Belorussian Military District. In 1938, he graduated with honors from the Frunze Military Academy. From September 1939 to December 1940, he was in China as Chief of Staff of Soviet military advisers at the headquarters of Chiang Kai-shek. Upon returning to the Soviet Union, he was made Chief of Staff of the 11th Motorized Machine Gun Artillery Brigade at Kaunas in the Baltic Special Military District. In March 1941, he was appointed Chief of Staff of the 202nd Motorized Division. Later that year, he took command of the 254th Rifle Division. Later, during World War II, he commanded the 73rd Rifle Corps (1943–1944) and the 128th Rifle Corps (1944–1945). After World War II he was Chief of the General Staff and Deputy Commander-in-Chief of the Soviet Air Forces (1950–1953). In December 1953, he was chosen to personally execute Lavrentiy Beria as part of a plot led by Nikita Khrushchev and assisted by the military forces of Marshal Georgy Zhukov (Batitsky was Colonel-General and First Deputy Commander of the Moscow Military District at the time). Thus, a future Marshal of the Soviet Union personally killed a former Marshal of the Soviet Union (Beria held this rank from 1945 until he was arrested in June 1953). Batitsky died in Moscow in 1984. ^ "Pavel Batitsky". warheroes.ru (in Russian). This page was last edited on 19 January 2019, at 08:09 (UTC).